Fig. 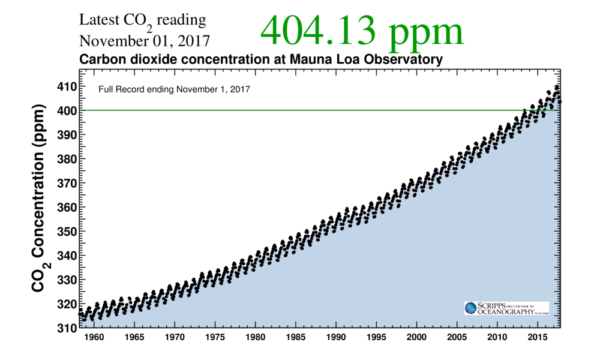 1 Perhaps the most important scientific measurement series of the 20th century: the CO2 concentration of the atmosphere, measured on Mauna Loa in Hawaii. Other stations of the global CO2 measurement network show almost exactly the same; the most important regional variation is the greatly subdued seasonal cycle at stations in the southern hemisphere. This seasonal variation is mainly due to the “inhaling and exhaling” of the forests over the year on the land masses of the northern hemisphere. Source (updated daily): Scripps Institution of Oceanography. The claim “95 percent from natural sources” and the “0.0016 percent” are simply wrong (neither does the arithmetic add up – how would 5% of 0.04 be 0.0016?). 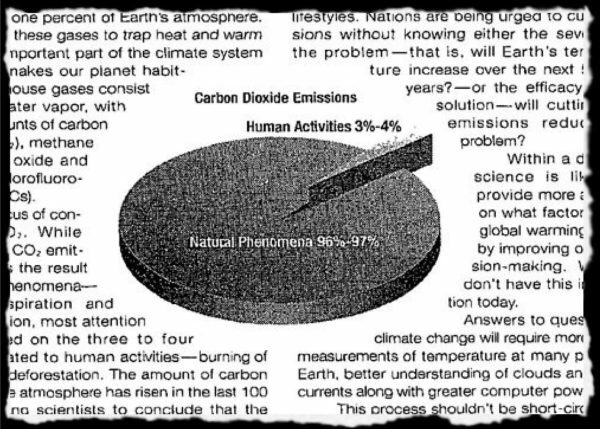 These (and similar – sometimes you read 97% from natural sources) numbers have been making the rounds in climate denier circles for many years (and have repeatedly been rebutted by scientists). They present a simple mix-up of turnover and profit, in economic terms. The land ecosystems have, of course, a high turnover of carbon, but (unlike humans) do not add any net CO2 to the atmosphere. Any biomass which decomposes must first have grown – the CO2 released during rotting was first taken from the atmosphere by photosynthesis. This is a cycle. Hey, perhaps that’s why it’s called the carbon cycle! That is why one way to reduce emissions is the use of bioenergy, such as heating with wood (at least when it’s done in a sustainable manner – many mistakes can be made with bioenergy). Forests only increase the amount of CO2 in the air when they are felled, burnt or die. This is immediately understood by looking at a schematic of the carbon cycle, Fig. 3. Fig. 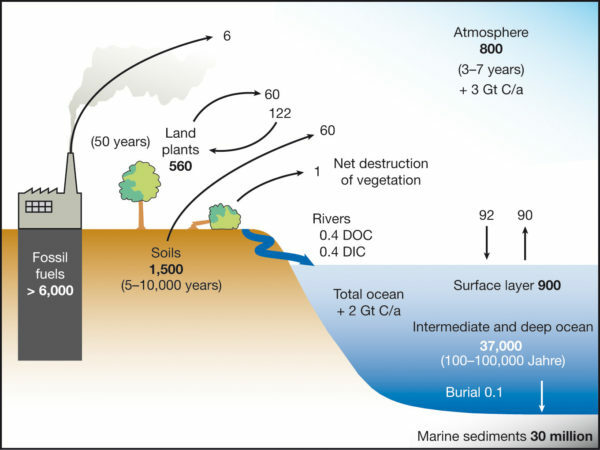 3 Scheme of the global carbon cycle. Values ​​for the carbon stocks are given in Gt C (ie, billions of tonnes of carbon) (bold numbers). Values ​​for average carbon fluxes are given in Gt C per year (normal numbers). Source: WBGU 2006 . (A similar graph can also be found at Wikipedia.) Since this graph was prepared, anthropogenic emissions and the atmospheric CO2 content have increased further, see Figs 4 and 5, but I like the simplicity of this graph. If one takes as the total emissions a “natural” part (60 GtC from soils + 60 GtC from land plants) and the 7 GtC fossil emissions as anthropogenic part, the anthropogenic portion is about 5% (7 of 127 billion tons of carbon) as cited in the Welt article. This percentage is highly misleading, however, since it ignores that the land biosphere does not only release 120 GtC but also absorbs 122 GtC by photosynthesis, which means that net 2 GtC is removed from the atmosphere. Likewise, the ocean removes around 2 GtC. 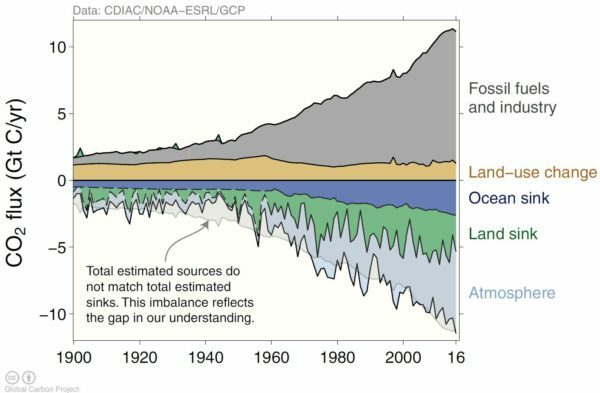 To make any sense, the net emissions by humans have to be compared with the net uptake by oceans and forests and atmosphere, not with the turnover rate of a cycle, which is an irrelevant comparison. And not just irrelevant – it becomes plain wrong when that 5% number is then misunderstood as the human contribution to the atmospheric CO2 concentration. The natural earth system thus is by no means a source of CO2 for the atmosphere, but it is a sink! Of the 7 GtC, which we blow into the atmosphere every year, only 3 remain there. 2 are absorbed by the ocean and 2 by the forests. This means that in the atmosphere and in the land biosphere and in the ocean the amount of stored carbon is increasing. And the source of all this additional carbon is the fact that we extract loads of fossil carbon from the earth’s crust and add it to the system. That’s already clear from the fact that we add twice as much to the atmosphere as is needed to explain the full increase there – that makes it obvious that the natural Earth system cannot possibly be adding more CO2 but rather is continually removing about half of our CO2 emissions from the atmosphere. Fig. 5 shows where the CO2 comes from (in the upper half you see the sources – fossil carbon and deforestation) and where it ends up (in the lower half you sees the sinks), in the course of time. It ends up in comparably large parts in air, oceans and forests. The share absorbed by the land ecosystems varies greatly from year to year, depending on whether there were widespread droughts, for example, or whether it was a good growth year for the forests. That is why the annual CO2 increase in the atmosphere also varies greatly each year, and this short-term variation is not mainly caused by variations in our emissions (so a record CO2 increase in the atmosphere in an El Niño year does not mean that human emissions have surged in that year). While most of the CO2 emitted by far is the result of natural phenomena – namely respiration and decomposition, most attention has centered on the three to four percent related to human activities – burning of fossil fuels, deforestation. We conclude that ExxonMobil contributed to advancing climate science—by way of its scientists’ academic publications—but promoted doubt about it in advertorials. Given this discrepancy, we conclude that ExxonMobil misled the public. Another age-old climatic skeptic myth, is that the CO2 is coming from volcanoes – first time I had to rebut this was as a young postdoc in the 1990s. The total volcanic emissions are between 0.04 and 0.07 gigatonnes of CO2 per year, compared to the anthropogenic emissions of 12 gigatons in 2016. Anthropogenic emissions are now well over a hundred times greater than volcanic ones. The volcanic emissions are important for the long-term CO2 changes over millions of years, but not over a few centuries. As already mentioned and shown in Figs. 4 and 5, the oceans absorb net CO2 and do not release any. The resulting increase in CO2 in the upper ocean is documented and mapped in detail by countless ship surveys and known up to a residual uncertainty of + – 20% . This is, in itself, a very serious problem because it leads to the acidification of the oceans, since CO2 forms carbonic acid in water. The observed CO2 increase in the world ocean disproves another popular #fakenews piece of the “climate skeptics”: namely that the CO2 increase in the atmosphere might have been caused by the outgassing of CO2 from the ocean as a result of the warming. No serious scientist believes this. Remember also from Figs. 4 and 5 that we emit about twice as much CO2 as is needed to explain the complete rise in the atmosphere. In case you have not connected the dots: the denier myth of the oceans as cause of the atmospheric CO2 rise most often comes in the form of “the CO2 rise lagged behind temperature rise in glacial cycles”. It is true that during ice ages the oceans took up more CO2 and that is why there was less in the atmosphere, and during the warming at the end of glacial cycles that CO2 came back out of the ocean, and this was an important amplifying feedback. But it is a fallacy to conclude that the same natural phenomenon is happening again now. As I explained above: measurements clearly prove that the modern CO2 rise has a different cause, namely our fossil fuel use. What is the same now and over past glacial cycles is not the CO2 source, but the greenhouse effect of the atmospheric CO2 changes: without that we could not understand (or correctly simulate in our climate models) the full extent of glacial cycles. We hope not, and we hope you will neither fall for the claim that 0.0125 percent of CO2 (that’s the 125 ppm increase caused by humans) can’t be bad because that number is small. Of course, the amount of CO2 in the air could also be expressed in kilograms: it is 3200 billion tons or 3,200,000,000,000,000 kilograms. Of this humans are responsible for almost 1000 billion tons. (Does that sound more harmful than 0.0125 percent?) Since the year 1870, we have even emitted a total of about 2,000 billion tons. As already explained, forests and oceans have removed about half of that from the atmosphere. So let’s finally come to the climatic effect of the CO2 increase. As for cyanide, the effect is what counts, and not whether compared to some large mass the fraction is 10 percent or 0.01 percent. The dose effect of toxins on humans can be determined from experience with victims. 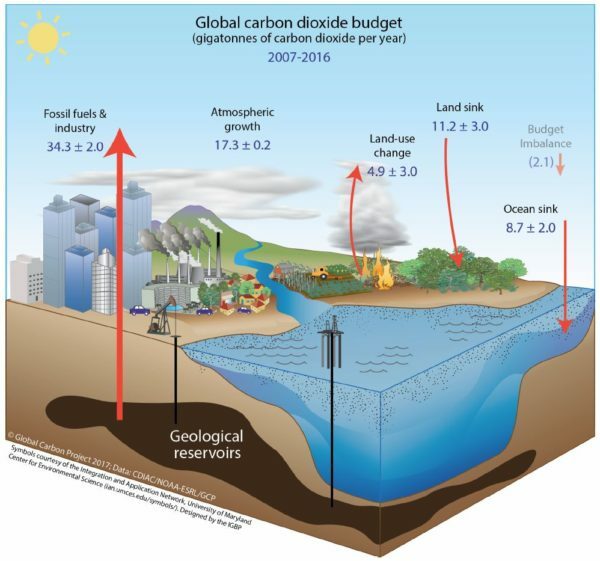 The climatic impact of greenhouse gases can either be calculated on the basis of an understanding of the physical processes, or it can be determined from the experience of climate history (see my previous post). Both come to the same conclusion. The climate sensitivity (global warming in equilibrium after CO2 doubling) is around 3°C, and the expected warming to date, due to the current CO2 increase, is around 1°C. This corresponds quite exactly to the observed global warming (Fig. 7). For which, by the way, there is no natural explanation, and the best estimate for the anthropogenic share of global warming since 1950 is 110 percent – more on this in my previous post. Fig. 7 Time evolution of global temperature, CO2 concentration and solar activity. Temperature and CO2 are scaled relative to each other as the physically expected CO2 effect on the climate predicts (i.e. best estimate of the climate sensitivity). The amplitude of the solar curve is scaled as derived from the observed correlation of solar and temperature data. (Details are explained here ). This graph can be created here and you can copy a code that can be used as a widget in any website (as in my home page), where it is automatically updated every year with the latest data. Thanks to Bernd Herd who programmed this. CO2 produced by all the volcanoes in the world: 200 million tons per year (US Geological Survey). By human technology: 35 billion tons per year (US Dept. of Commerce Energy Information Agency). Divide A by B. Discuss. That’s not quite correct. What you need is a dipole moment for the molecule to absorb. Since O2 and N2 are homoatomic, by symmetry they have no dipole moment and no IR absorption. Heteroatomic molecules like HCl absorb IR. Even though CO2 has no dipole moment and some vibrational modes are IR inactive, some vibrations do cause a dipole and are IR active. Perhaps expressing it as 1.96 kg/m² of the Earth’s surface might help some. I believe Exxon are in court accused of misleading investors over the climate change issue. Maybe there will finally be some accountability. [Response: Thanks for those links. We wrote about the carbon isotope evidence in some of our very first RealClimate posts, more than 10 years ago. One of the first foolish remarks I heard on this topic was a comment on an RC thread claiming that the explosion of the Mt. St. Helens volcano had emitted more CO2 than all human activity, ever. What?! I can’t believe that :’D To be serious: These old myths pop up for many decades now. And these old myths will pop up as long as the fossil fuel industry will exist. These professional denier guys are not interested in facts within the public discourse, they follow strict radical constructivism ( “Verum esse ipsum factum”, https://en.m.wikipedia.org/wiki/Constructivist_epistemology#Radical_constructivism ) that means, they don’t investigate reality, they MAKE reality, they MAKE politics, they MAKE the public discourse ect (at least from their point of view). These deniers will never stop denying, never. Denying is the very job of deniers, that simple. These guys will never stop denying, until Empire stops working. Soon. The number is good but it is “almost” 1,000 Gt(CO2). 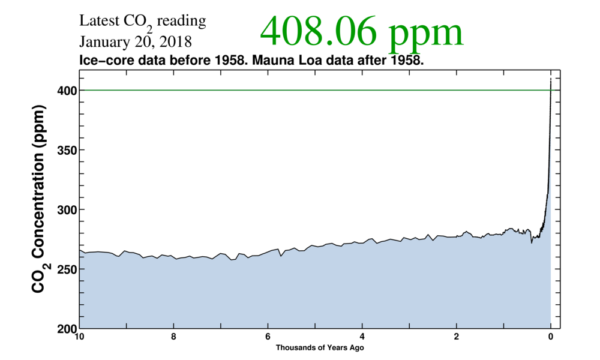 The actual weight of 125ppm (@ 2.13Gt(C)/ppm) woild be 977Gt(CO2). So, mindful of big numbers that may end up a few bead short of an abacus, for a planet of 510.07 million sq km that would yield 1.9157kg(anthroCO2)/sq m. Or 26 billion billion anthropogenic CO2 molecules above each square metre of Earth. And if each of these molecules is 3 x 2 Å, that would mean there are 44,000 layers of anthropogenic CO2 molecules floating between the planet surface and space. But remember that would be increasing at perhaps 770 layers per year, getting on one additional layer of CO2 in 10 hours. Carbon emission reports have indicated several years (roughly 2011 to 2014) of flat-ish emission totals. Is there any evidence that the flat-ish emission reports are showing up in any change in the rate of increase of CO2 in the atmosphere? If emission reports showed no increase in total annual emissions, should we have every reason to expect that the atmospheric CO2 accumulation numbers would also fall to a flat rate of increase instead of continuing to rise at an accelerating rate? but I think there is something amiss on the X axis beginning around 2010, but the graph sure makes it look like we have really reduced the rate of emissions since 2010, doesn’t it? Good article indeed. These are some of the most bizarre climate skeptic myths, it is hard to see how they keep cropping up again and again, when even climate skeptics like Fred Singer suggests they should be dropped! FWIW I wrote a peer-reviewed comment paper addressing some of these issues (with a lot of help from Philip Goodwin and others) in response to a paper on the residence time of CO2 by Prof. Robert Essenhigh. There is a pre-print here. I had (somewhat naively ;o) hoped a peer-reviewed paper explaining some of these basic issues would go some way to preventing the promulgation of these arguments on climate skeptic blogs, but of course it didn’t. Well-done, but the recurring need to rebut this is a tad dispiriting. Bystanders often ‘got it’, from what I can tell, but the desire not to understand on some folks’ part is pretty much impervious. Thanks for a clear and succinct summary. To add to Tamino’s comment. The atmospheric CO2 analysis network was established to sample along multiple latitudes – and many stations sample daily. So any surface “volcanic puff” would show up – IF there were any. Geologists monitor earthquake activity – and oceanographers-geologists monitor underwater vents – so that possibility also gets addressed. Please could you include a link for the Die Welt article in the links? It may be a right-leaning news outlet but there’s quite a leap from that to climate-denial and number trickery. I find Die Welt’s environmental coverage to be extensive and serious, and I would be most interested to read the full article to see the context. Is there any evidence that the flat-ish emission reports are showing up in any change in the rate of increase of CO2 in the atmosphere? Didn’t my request for the Die Welt link suit you? I can kind of guess why because googling in Google News / Google for die Welt and 0.0016, or related searches based the text in your quote, turns up only one thing – your article. I don’t think there is any Die Welt article that you can link to. The reason I think that is because die Welt has trustworthy science and environmental coverage. I am a scientist by the way, and concerned about climate change. But it’s the last time I will look at this website because you are not honest in handling reader comments and, if you are not honest in that, you cannot be trusted as a source of information. Discourse is not restricted only to writing texts or speaking at conferences. Places, titles, groups and institutions etc, they all contribute for the production of discourse. So, if a scientist or a scientific discourse is presented in equal terms to an expert/denialist or dicourse (science=denial) in the public domain, if both gain legitimacy, that is not just a problem outside of science. In the age of internet, isn’t there anything to do in order to collectively address that problem in a better way? Iniatiatives like Skeptical Science are great (and one of my sources), but they do not represent the broad scientific community. Uh, dude, you allowed all of an hour and 35 minutes before going into a childish temper tantrum because your request had not immediately been acceded to. You say you are a scientist? Well, so is Stefan, and so are the other moderators. They have other things to do with their time than posting links for petulant readers. It is useful for Realclimate to produce this kind of ‘back to basics’ article, but the fact that it is still necessary is evidence that we are dealing with idiots and the wilfully ignorant. I’ve been rebutting ‘humans have only produced 3 or 4 or 5% of CO2’ nonsense for over ten years (the last time being earlier this evening) and it astonishes me that anyone with an IQ above that of a tortoise could be fooled by such stuff. useful to show that human CO2 emissions from those sources alone are more than enough to account for all the increase in atmospheric CO2 since 1750. This is a bit misleading: “The land ecosystems … not add any net CO2 to the atmosphere. Any biomass which decomposes must first have grown – the CO2 released during rotting was first taken from the atmosphere by photosynthesis.” This assumes that the biomass is allowed to grow back. IT’S NOT! Humans have (1) converted vast forests to agriculture, and (2) converted vast forests from carbon rich old growth to carbon deficit tree farms. Unless the forests are allowed to grow back, it’s not carbon neutral. Furthermore, the time that it takes to grow back is a problem. During the entire period of regrowth, which might take 200 years, there atmosphere has extra CO2 in it causing warming. I read, some time ago, that it was estimated it took the world 1,000,000 years to accrue the fossil energy consumed each year. Has that stood the test of time? I am afraid it’s not only the fossil fuel industry, who keeps those myths bubbling up. It’s hundreds of millions, if not billions of people, who instinctively feel, that their way of life would have to change, if they admitted the truth and soundness of the climate warming concept. People generally believe what science tells them many times and in many respects – only here, when it comes to reduce their consumption ever so slightly, suddenly they turn to a stunning mistrust in mainstream science and claim to do science better than the scientists. So whoever reads this – put your money where your mouth is and communicate it. We are group animals, not science animals. If the group of the doers grows and starts to lead, sooner or later, the others will follow. That is a whole lot of misinformation. The only thing you fail to mention is that historically, based on ice cores, warming was always followed by an increase in atmospheric Carbon Dioxide. If you accept this some of the increase in Carbon Dioxide concentration is due to this natural phenomenon, claiming that all of the increase is man made ignores this fact supported by the same evidence used to support climate change. Well… you just can consider atmospheric chemistry, it’s straigthforward. Biomass now grows faster with 405 as opposed to 280 ppm of CO2 200 years ago. It’s a simple consequence of Le Chatelier’s law. Now I quite agree and efficient mitigation is certainly forests being allowed to grow back and more generally photosynthesis being favored over rotting by all means. A possible solution is rather in biology and changes in agricultural practices as opposed to physics. Indeed it is hardly possible technically to rapidly reduce global fossil fuel use without killing millions of people. Renewables can’t by now seriously replace fossils. Even a rich country’s attempt in this respect namely Germany’s is a failure and actually increased the global emissions. The relevant waste of money to no avail is a catastrophe. It might be educational to embody the kilogram pre square meter meme as a public art installation. might be invited to step into a one square meter plexiglass telephone booth with a wet floor , there to report what happens when they sprinkle a kilo of powdered dry ice around their feet. More ambitiously some museum courtyard might host a pyramid of stacked dry ice blocks containing one person’s share of the anthropogenic CO2 in the air – some 160 tonnes of the stuff, and infrared thermal cameras set up upwind and downwind of it , with flat screen displays allowing passers by to see their thermal glow disappear as IR opaque plumes of CO2 waft between them and the thermal imaging cameras. I wonder if he realizes how dumb this makes him look. AG 26: Renewables can’t by now seriously replace fossils. For Emanuele Lombardi @ 22, sorry there are two problems with your argument. First, while the ice core record does indeed show a feedback increase in atmospheric CO2 following the initial orbital-driven warming, that increase lags the warming by 800-1000 years due to the thermal inertia of the ocean. It’s only been 267 years or so since the advent of the industrial revolution (circa 1750) and the beginning of the modern warming, way too soon for a CO2 feedback signal. The ocean will first have to cease being a net absorber of CO2 before it can become a net emitter of CO2. Second, even if and when the ocean becomes a net emitter of CO2, that will be because of human-caused warming, not some natural phenomenon. Your argument fails on two counts. Thanks to NASA’s Orbiting Carbon Observatory (launched 2014) there are some very nice 3D data-based visualizations of the yearly biological CO2 cycle in the northern hemisphere as well as of the main human centers of fossil CO2 emissions, and this shows how the atmospheric CO2 is growing each year. You can really see the localized emissions from areas with large fossil fuel use, as well as from large fires in other parts of the world. It’s direct evidence of where the emissions are coming from. Like a bottle of wine with a cork, sea ice can prevent CO2-rich water from releasing its CO2 to the atmosphere. The Southern Ocean is a key area of exchange of CO2 between the ocean and atmosphere. The expansion of sea ice during the last ice age acted as a ‘lid’ on the Southern Ocean, preventing CO2 from escaping. The researchers suggest that the retreat of this sea ice lid at the end of the last ice age uncorked this vintage CO2, resulting in an increase in carbon dioxide in the atmosphere. On biological carbon storage, much of the science points to the terrestial biological sink for carbon being in some trouble; warming soils mean less carbon storage in soil; plant photosynthesis might get saturated at some point, weaking that sink (plus, all the fires are counteracting that trend), and then there’s the future of the permafrost and shallow marine sediments. Hence, it still seems very hard to say what the future carbon trajectory would look like if humans eliminated all fossil fuel combustion overnight via replacement with renewables (which isn’t plausible, I’d guess a full-scale technological effort to do so would take at least 20 years, probably more like 40 or 50). Here is good site, which has much to say about the Exxon law suits. The site should be put in the “other sources” column. You say “the oceans absorb net CO2 and do not release any.” The last part should not be taken out of context. There is outgassing, such as when cold water rises and mixes with warm surface water, but the oceans absorbs a lot more then they give up. Whether the oceans net absorb or release CO2 during a period of warming depends not just on the warming but also on changes in the partial pressure of CO2 in the atmosphere above the oceans. If the effect of increasing the partial pressure of CO2 is greater than the effect of the warming ocean then there will be a net transfer of CO2 from the atmosphere to the oceans. That is what has happened in the last few hundred years, because CO2 was being added to the atmosphere due to human burning of fossil fuels and other activities. During glacial to interglacial transitions there was no addition of CO2 to the atmosphere from extraneous sources like human beings and thus there was a net release of CO2 from the oceans and terrestrial sources. This statement isn’t entirely true. CO2 and temperature both rise over the duration of a deglaciation. The ice-core-based evidence suggests that the very beginning of a deglaciation occurs without a rise in CO2. This is because CO2 does not initiate deglaciation. See this SkS coverage. This is all well understood, except by climate change deniers. And lags in CO2 rises surely have no relevance to what you are trying to say. The rise in CO2 during a deglaciation evidently is not due to fossil-fuel use. It is natural. It is a result of a warmed climate. It saw an 80ppm rise in CO2 with a 6ºC increase in global temperature. We have seen a 1ºC rise in global temperature over the last century or so. If the temperature-CO2 relationship holds, we perhaps could see a 13ppm rise in CO2 from this temperature rise. Yet over this period we see a CO2 rise ten times bigger. Of course, the global temperature doesn’t simply rise. It wobbles about and those wobbles also show an associated CO2 wobble. It is quite evident. Yet, as this two-panel graphic shows (see HERE – usually two clicks to ‘download your attachment’), the CO2 rises (they lag global temperature rises by about 10 months) are associated with a net CO2 rise far less than 13ppm. No facts are being ignored by climate science. Agree that Germany’s so called “Energiewende” has been kind of a failure so far. But it’s the same as with the European cap-and-trade-system: the concepts are sound, but they have been watered down by half-heartedness. Those are both good seeds, that were not allowed to grow and become beautiful trees up to now. Especially the European cap-and-trade-system is hampered by the principle, that in a group committed do unanimity, the slowest imposes his pace to all. That’s why it is so important to not look at what others do and go forward with the pace you yourself consider the best. Consider, besides giving your house a top notch heat insulation, driving no car or a very fuel efficient &c, to offset your remaining emission via existing offsetting project – there are a couple good webplaces for that. All gases whose molecules possess a dipole moment absorb IR radiation dependent upon their vibrational modes. Even N2 and O2 absorb radiation very weakly when they are in collision with any other molecule. Collisions produce transient dipoles with consequent transient absorption of IR radiation. Otherwise an excellent review of the global warming effect of human contributions. I’m not sure I understand what you’re trying to say. More information on ice ages and CO2 can be found on this site by simply searching for “ice age CO2”. May I suggest you do that before posting again. So Paul, got an apology for accusing the author of dishonesty? Perhaps time to reassess whether Die Welt has “trustworthy science and environmental coverage”or merely material that comforts your political values. I’d like some proof of RCs dishonesty in handling readers comments too. Yep, Russell, they should suddenly feel their feet get all nice, cuddly and warm, as “backradiation” from the heat trapping gas warms their tootsies up like a blanket. …historically, based on ice cores, warming was always followed by an increase in atmospheric Carbon Dioxide. If you accept this some of the increase in Carbon Dioxide concentration is due to this natural phenomenon, claiming that all of the increase is man made ignores this fact supported by the same evidence used to support climate change. Good thought, but not actually correct, since the time scales are so different. There are lots of caveats about temporal resolution in the paleo data, and I’m probably not up to date on the latest, but the lags between warming and CO2 outgassing you mention were thought to be something like 800 years. Obviously, the modern FF emissions era is only a couple of centuries old, so the situations are not parallel. And remember, during deglaciations, outgassing from the oceans would have occurred in a context in which warming was occurring, but not an exogenous increase in atmospheric CO2–and outgassing (or not!) is affected not just by temperature but by the atmospheric partial pressure. In the current reality, we’re dramatically raising the latter. Why then does poster#26 say that Germany’s attempt to replace fossil fuels with renewables is a failure? Would said poster care to give some evidence to support thier claim, or would prefer to be put on the record as being a source of disinformation? Indeed it is hardly possible technically to rapidly reduce global fossil fuel use without killing millions of people. Renewables can’t by now seriously replace fossils. Even a rich country’s attempt in this respect namely Germany’s is a failure and actually increased the global emissions. Cherry-picking Germany is a pernicious bit of non-analysis. For one thing, the energiewende has not ended. It may be in doldrums, and Germany’s emissions targets are certainly precarious right now, but it’s not due to some failing in terms of renewable energy; it’s partly due to the fact that they chose to make their task enormously harder by simultaneously ending nuclear power, and partly due to the fact that they were among the technical and policy pioneering nations, and consequently made more mistakes than those who came later. But that’s against 18 years with declines–and the declines have clearly been much greater at that. (There are 6 years with declines of over 3%, and only one that reached that threshold, for instance.) The overall reduction from 1990 emissions is something on the order of 25%. And that’s just Germany. One should also consider other nations’ experience. You also fail to account for the negative impacts of fossil fuels, which are much larger than people think. To name two instances, in the ‘clean’ USA, there are tens of thousands of asthma cases annually which are exacerbated by particulates from transport and power generation (much associated with coal-powered thermal generation plants). There’s a considerable burden of mortality associated with that, too, so coal is quite literally killing Americans every day. And what does this do to the global CO2 emission ? Obviously more harm than good since they even accelerate ! And, alas they accelerate for very obvious reasons. Mining, manufacturing and implementing of wind turbines and solar panels can’t be done with renewables and needs a lot of fossil fuel and even more so since to get 1 MW renewable power fed to the grid implies the implementation of several MW of renewable sources plus backup or storage because of intermittence. For a lot of reasons there is, at least by now, no “solution” with renewable sources to power a civilization of 7+ billion people. I like when such paper gets back to the roots. In this regard, the “well-known greenhouse effect” part sounds condescending. May I suggest next time to introduce in a couple of sentences the work of John Tyndall and how the “lid on the pot” phenomenon has been anticipated for ages. I seem to recall that a few years ago it was a commonly proposed rule of thumb that supplying more than 20% of electricity to a sizeable area from renewable sources would be extremely difficult to impossible. Is my memory correct? Has that rule become, in Nixonian terms, inoperable? Just want to pop in and say thanks to the climate scientists on here for providing us all this info, and for rebutting the “skeptics” arguments (probably over and over as it sounds like the same ones keep popping up). Keep fighting the propaganda -at this point I can’t consider it anything else – and keep up the good work. Anthopogenic Global Warming (AGW) proponents proclaim that because carbon dioxide, methane, etc can absorb infra-red (IR), that only such gases absorb heat; they call these – even define incorrectly – the “Greenhouse Gases”. The majority (99.9%) of atmospheric gases nitrogen, oxygen and argon do not absorb IR. Somehow, absurdly, AGWers then infer these majority gases are unable to become warmer and contribute to Earth’s warming – that they cannot warm!! I’m sure that you’ve noticed that all the air about you is the at same temperature! Talk about the Emperor’s new clothes! All the gases in the air must have absorbed heat in some manner. They do. Like all substances, all gases absorb heat by conduction and/or convection (and some by IR as well) … otherwise they could never get heated! But that is what is implied by AGW – but never stated outright as it would reveal it is a daft theory. Therefore, all gases are Greenhouse Gases. And so, the amount of heat absorbed by air is more or less in proportion to the amount of each molecular species in the air. At about 0.04%, carbon dioxide is a very minor contributor to global warmth, and its effect via level changes on climate are even less – immeasurably small. Methane is an even tinier percentage and therefore, so is its effect. I’m not saying climate changes do not occur; they do – naturally – but with no association to the IR effect. The well-established ice-core data obtained at eg Vostok in Antactica, suggest Global Temperatures MAY rise a further 1°C naturally – but regardless of carbon dioxide levels (eg Chapter 1, fig 1). Despite knowing this, the AGWers don’t mention this either when they say their models “predict” confidently that Global Temperatures will rise. Further, Vostok suggests that within centuries, Global Temperatures will then plummet by some 10°C in just a few thousand years, ending the current stable-temperature Holocene Epoch in which human civilisation flourished. That will be THE challenge to civilisation.